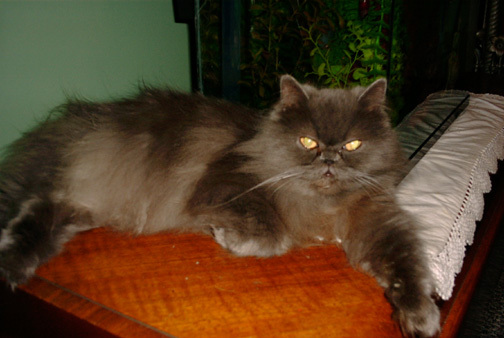 My Cat "Sheena"she's a Blue Persian, and our dog Taffy. Does she look spoiled to you? This is Sheena,she's a Blue Persian. I bought her from my sister's, sister in law. I thought $50.00 was a steal. She's spoiled, and thinks she owns me lol. She eats her cat food from her paw a piece at at time. If her food dish or water is empty she'll swat you to get your attention. Thankfully she keeps her claws in. We got Taffy at a yard sale.Someone was giving away puppies and she was just to cute to pass up.That was about 7 years ago. All her brother"s and sister"s looked like little beagles. 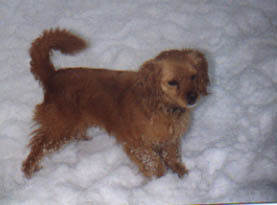 Here she is looking more like a Cocker.